Don't you love a good horror movie? Even better, a good, funny horror movie? Best of all, a film that takes its tastelessness to new heights, er, depths? If only. HELL BABY, the new rude, crude and ugly comic horror flick from Robert Ben Garant and Thomas Lennon, tries for all of this, but except for a few good laughs, often of the second-hand variety, manages to mostly waste our 98 minutes -- which is, in any case, far too long a running time for this kind of movie. 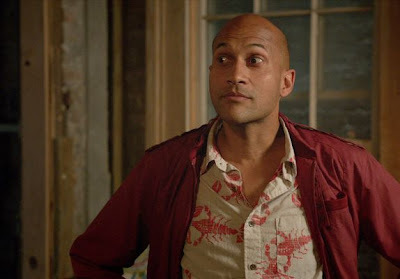 This is especially too-bad because the film's three leading actors are usually quite good: Rob Corddry (above, left), Leslie Bibb (above, right) and Keegan Michael Key (below) have all done sterling work and certainly will again. Here they must content themselves with pulling mostly unfunny business and, worse, repeating it ad nauseum. 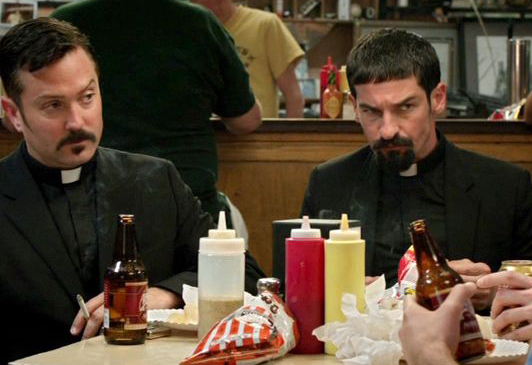 The filmmakers also take on roles in the film, playing a couple of mostly unfunny priests, below, who stop the action over and over again with their tiresome shenanigans. I suspect that if filmmakers Garant and Lennon and left their actors Garant (below, right) and Lennon (below, left) on the cutting room floor, the movie would have come in about 20 minutes shorter -- just the right length for the kind of spiffy spoof Hell Baby might like to be. The plot? Corddry and Bibb plays husband and pregnant-wife who have bought a New Orleans "fixer-upper" that reeks of mange and much else that you wouldn't get near unless you were ultra-dumb movie characters trying your best to hold together a crap scenario. Mr. Key plays a homeless guy using the house as shelter (he always looks clean and nattily dressed for some reason, but maybe that's part of the humor) who keeps popping up over and over to scare the daylights out of the new tenants and bore us silly. Bibb goes from nice to naughty in record time and is pretty funny doing it, while Corddry, who can be masterfully funny, gets far too little opportunity here. Also eventually on hand is the Bibb character's sister (played by Rikki Lindhome, above). There's also a fairly funny and very grizzly set piece involving a gynecologist, and more repetitive stuff that brings back and back and back a pair of local cops (left to right, below: Paul Scheer and Rob Huebel). We do get to see that titular character born and (for a very few moments) bred. This concluding section may put you in mind of another, much better movie: Larry Cohen's It's Alive, made back in the day when horror movies were content to scare us and had not yet begun to overdose on would-be ironic humor. I admit to laughing at some of the tastelessness on display, which can be pretty funny, if you've a fondness for this kind of thing. Yet the film, first to last, has a semi-improvised and slapped-together feel. I've always heard that real comedy takes discipline, but that's the single thing most missing from this odd concoction. Hell Baby -- from Millennium Entertainment -- opens this Friday, September 6, in ten major cities: Click here to view 'em all, with theaters listed, too. (In NYC, see the film at the AMC Empire 25; in the L.A. area, you'll have to drive to AMC's South Bay Galleria 16 in Redondo Beach.) The film is also currently playing via VOD, for those CPs who prefer to stay home and press the remote.